The Import color map node imports a color map in the form of an image file that you can apply to a terrain generation node, a transformation node, or a composition node via the Apply color map node. The output terrain is the same terrain as the input terrain, but with a color map applied to it. The color map is preserved throughout the graph unless a new color map is applied. To add a node, right click in the Graph Editor and select Create Node > Import > Import color map. Note that if the image has an alpha channel, it is discard and transformed to white. File information: Displays the Width, Height, and Bits of the mask. The minimum size supported is 64 x 64. The maximum size supported is 2048 x 2048. An error message appears if your file is smaller or larger than the minimum and maximum sizes. The Import color map links to an Apply color map node to apply the color map to a terrain generator.. 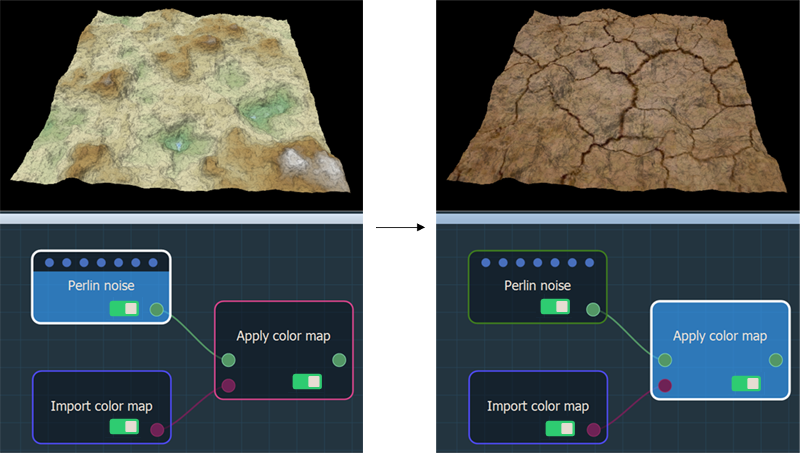 In the example below, we import a .tif texture to apply it as a color map to a Perlin noise terrain generator.